These day, “debris” gravy brings on a whole new meaning. I think that maybe a name change is in order. That’s great! I’m going to link to this recipe. I’m going to use the picture, too. It just looks too delicious. I would like to know where to get authentic french bread from New Orleans. Even a recipe would be nice. Po Boys aren’t authentically New Orleans unless you make them with the delicious kind made in New Orleans. Can you help me? A recipe would be nice. 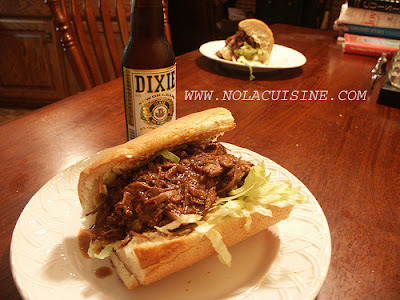 The chuck roast with debris gravy, po’ boy sandwich is a great recipe! Make sure you heed author’s advice to skim fat off of pan juices. I need a good Poboy bread recipe. Need a poboy bread recipe. From N.O., but live out of state. nedd recipe to use for Saints’ playoff game & SAINTS’ super bowl party. Can u help? GO SAINTS!!!! THANK YOU for this wonderful recipe! We’re going to make Debris Po’Boys for the playoff game today — GEAUX SAINTS!!! Your sandwich looks awesome. Can hardly wait to try it. Could I get the recipe for the po boy bread? Thanks! Chisesi’s doesn’t make a boiled ham. There hams are smoked. I was looking for a beef stock recipe and found your site which I think is awesome. Checked out your po’boy recipe and since I had everything needed, I made it. It was WONDERFUL!!!!!!! It’s a easy recipe, and tasted great. I cant wait to make it again. my family sure miss the po’boys from the spur gas stations just can’t get the good french bread anywhere but new orleans! We had this delicious Po’ Boy for dinner. This is such a great recipe. I used a mixture of shredded iceberg lettuce and shredded cabbage. I didn’t know what else to do with the chuck roast and am bored with the same ol’ pot roast. This was a hit. I toasted the French bread on a pan before putting the sandwich together. This sounds very much like how my Mom and Grandma make Pot Roast back home in North Carolina. We are having this for dinner tonight!! Yum! My daughter is living in Utah and misses our ‘real’ food. I will forward this to her. I saw this a few weeks ago just after commenting to the wife that I hadn’t had a GOOD roast beef poboy in years. I am a born and raised New Orleanian and still reside here. Recipe looked good and thought I’d give it a try. ( I do QUITE a bit of cooking). This is truly one of the best EVER roast beef sandwich recipe’s !!!! I fed 3 sons and 2 friends ( cooked 6 lbs. of roast)besides the wife and I, and each and every one of them wanted to know when I was going to make it again. Can’t say enough about it..simply outstanding !!!!! Oh and by the way…the bread does make a huge difference !! Not too long ago had a restaurant try to sell me a roast beef poboy on bun!? Can’t see how it would be a poboy when served on bun…but hey go figure. Needless to say I passed on it and thats what brought me here. Good receipe..Best Roast beef poboy is at Parasols in the irish channel..CORNER OF THIRD AND CONSTANCE…WITH A COLD ABITA DRAFT,…. Sooo good! Made this for my hubby today and he asked for seconds!!! Thank you so much! I’ve shared your site with several friends. We made this for our Mardi Gras Party this year and it was soooo good. Many revelers have alreayd requested the recipe. We will definitely bookmark this recipe for next year. Do you have a good gumbo recipe? Thanks for another great recipe…We used to always get po-boys at Danny and Clyde’s or Short stop. Sure miss them. And you’re right, I’ve been all over and you can’t get the bread anywhere else. Loved the recipe, one suggestion. Teh second time I made it I coated the roast in a little seasoned flour before browning it. This makes the gravy just a little thicker. Have made the debris sandwich a few times now and it is awesome! I live in Kentucky, so its hard to find good French bread, but the roast beef is the star here. By all means, make this recipe. Im attaching a link to show you my sammitch. I’ve made the beef po’ boys on numerous occassions, always with rave reviews. Thanks for a great recipe. The only thing I do differently is I add a tablespoon of creole seasoning while its cooking. GREAT! Does anyone know of anyplace I can order authentic po’ boy bread? Just made this recipe and did it with a lean sirloin roast. Yummy!! Me to!! Please advise where I may order NOLA REAL french bread to make the Roast Beef Po Boys. I could try to make my own but not so good at the bread making. I have a craving for a really great Roast Beef Po Boy. Thanking you in advance for your help and quick response. I grew up in metry and miss the old short stop on transcontinental, it was gone way before katrina and so was I. In a town where RB PO BOY’s are a daily occurrance, it does amaze me how abundant average PoBoy’s are. I lived in New Orleans for 33 years and this is an amazing Poboy. My husband gave it a 10. I cooked it for 4 hours also. I have an urge to lick my computer. i lived in ycloskey, south of chalmette in 1978 for a few months. is there still a resturant named mutt’s there? You’re kidding, right? You must not be a local as we know that Mother’s roast beef po boys are not that good at all. In fact most things at Mother’s would not sell good outside the French Quarter and they would go out of business within six months. If it were not for the tourist, Mother’s would close down because the locals know the food is not worth the price they charge. If you truly want a great roast beef po boy try R& O’s out in Buck Town by the lake. They make there own roast beef and french bread daily. Also Crabbyjacks makes a good roast beef po boy but still not as good as R & O’s is. BTW, the viet Banh based sandwiches are very good in their own right IMHO..
certainly not a softshell crab or roast beef po-boy… but a very tasty alternative…. I grew up on the westbank. Eating Danny and CLydes roast beef po boys. For years I have wanted to mimic a New Orleans Roast beef Po Boy ..finally i have foudn the best recipe hands down! I just finished enjoying my best ever home made po boy all the way in Northern Italy. Thanks for sharing a bit of New Orleans with the rest of the world! I will be making this for my Italian Friends hehe. I grew up in the Irish Channel and ate at Parasol’s regularly. Roast beef poboy dressed, a Barq’s root beer, and half a roll of paper towels was always the order. As a kid, we always wore old clothes there because we would be covered in the gravy after a few bites. I was really good at licking the mixture of gravy and mayonaisse (pronounced mynez) off my arm. The only poboy that comes close to theirs is at Bear’s in Covington which is where i live now. I’m lookin forward to giving your recipe a try. It sounds great! I have to agree that Mother’s is for tourists and Parasol’s is for locals. Afterall, the locals know what a true poboy tastes like. As for da bread, toasted Leidenheimer’s was always our choice for homemade poboys. I see people asking for the french bread receipe. I don’t live New Orleans anymore and do miss the food. What I have found that comes close to New Orleans french bread is the Pepperidge Farms, Hot and Crusty Twin French bread. Make sure you sprinkle the top with water before baking to make it crusty. Also, making any kind of beef roast in a slow cooker makes great roast beef bo boys. Hey ! you hit the bulls eye with this one.try this add 1/2 tsp. zatarans liquid crab spice when you cook it.YA !YA ! i had it like that awile in N.O. last year and it knocked your socks off. Amazingly good, I have made it at least twice a year since ’07. I made one change though. I was short on stock so I poured one of my homebrewed Baltic porters into it and it made a big difference. You should try it if you get a chance, it’s a real roasty, and malty beer and supports the flavors nicely. In case you can’t find a Baltic Porter, substitute a Russian Imperial Stout or a Dopplebock. I grew up in N.O. and used to go to Martin Brothers Original Po-Boy Restaurant on St. Claude Ave. (I’m talking about 60 years ago), to eat their Po-Boy sandwich at night after a date. They were the original po-boy restaurant for roast beef and they used sliced roast beef, not the kind in your picture, and plenty of gravy. They also made shrimp, soft-shell crab and combination(cheese and ham) po-boys. They were the BEST!! You’re right about Vietnamese places having good French stuff. Years ago I spent a few months in Houston. About the only places you could buy coffee and chicory dark roast New Orleans coffee–CDM particularly–was in the Vietnamese groceries. Wow great post! IT looks like you a fantastic meal on your hands. I highly recommend my client La Cense Beef when it comes to organic beef and Steak recipes. They truly are a treat! Did you know that Gambino’s bakery ships their french bread to you!!?? You can order from them online and they send you french bread!!!!!!!! You can also order it from cajungrocer.com but I have only ordered from Gambino’s seeing as I know their bakery and being born and raised in New Orleans… its traditional! After I married an Army soldier and had to move away I have become pretty good at finding what I need when I need it!! Often you can find pretty good bread at a Vietnamese sandwich shop. Seems odd, but Vietnam was a French colony for long enough that the bread became a mainstay cultural food. I usually get it for about $1.50 a loaf, and the loaves are about 2 1/2 feet long. It’s obvious the picture wasn’t taken at Parasol’s. It’s got a plate!! I love them at Parkview. Making this again. Last time was the first time and my wife cleaned the pan with the extra bread. Toughest part is the 4 hrs that I smell it cooking. Excellent recipe and easy to make. Thanx! Don’t know if you check on your posts when they’re this old, but you said you were working on a recipe for the New Orleans Po’ Boy Bread, or Long Bread, and it needed some tweaking. Did you ever finish the recipe and is it posted somewhere on your blog that I can’t find??? PLEASE – I am begging for your bread recipe. I love making bread… by hand! No bread machine in my house. I would love to know how to make the NO style french bread. I have had no luck replicating. You can’t beat this recipe. I add some beer to the stock and use a little more garlic.But that’s just my personal taste. We have a Portugese bakery here and we get their grinder rolls fresh from the oven.